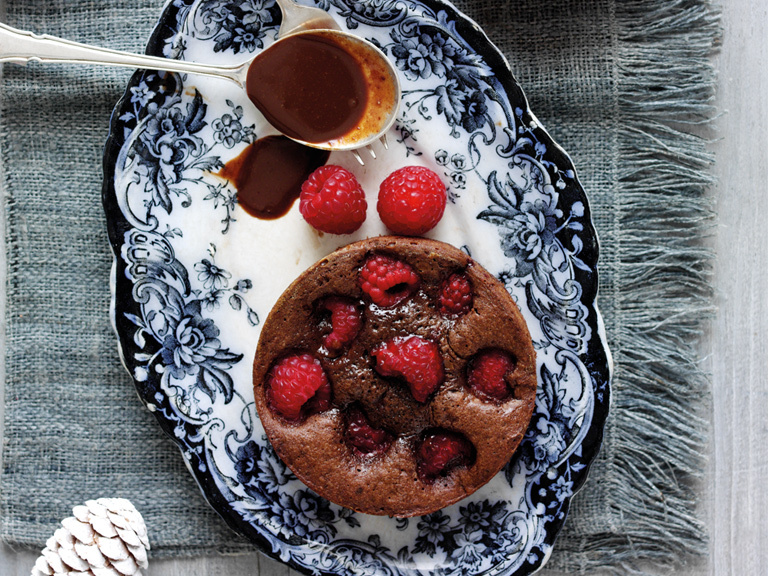 These baked chocolate puddings with raspberries and a spiced chocolate sauce that can be made in advance and baked at the last minute. These rich dark chocolate puddings can be made in advance and cooked for 10 minutes. Serve with a drizzle of warm cinnamon spiced chocolate sauce and complete with a scoop of vanilla ice cream – then sit back and bask in the compliments. 1. First make the puddings. Brush the inside of 4, 7.5cm (3 inch) diameter, 2.5cm (1inch) deep individual Yorkshire pudding tins or foil dishes with a little butter then line the base of each tin with a circle of non-stick baking paper. Add the chocolate and butter to a small saucepan and heat very gently, stirring until both have melted then take off the heat. 2. Add the eggs and sugar to a bowl and whisk together for a minute or two until frothy. Gradually whisk in the melted chocolate and butter mix then the flour and cocoa until smooth. 3. Divide between the buttered dishes then scatter the raspberries over the top. Chill for 1-2 hours, or longer if it suits you better until ready to cook. 4. Add all the sauce ingredients to a small saucepan and heat very gently, stirring until smooth then take off the heat. Cool then cover and transfer to the fridge. 5. When ready to serve, preheat the oven to 180oC (160oC fan assisted), Gas Mark 4. Put the puddings on to a baking sheet then cook for 10 minutes or until just set in the centre. 6. Take out of the oven, leave to cool for a minute or two then loosen and remove from the tins. Peel away the lining paper and transfer to serving dishes. Decorate with extra raspberries, warm the sauce through then drizzle over the puddings and serve with scoops of vanilla ice cream. Try these puddings with blackberries too or a mix of raspberries and blackberries. Our thanks to Seasonal Berries for providing this recipe.